REGISTRATION At Sunset Beach from 7am to 830am in parking lot. No entries taken after 8:30. COURSE INSTRUCTIONS Water Start with swimmers lining up behind two 40’’ orange buoys. 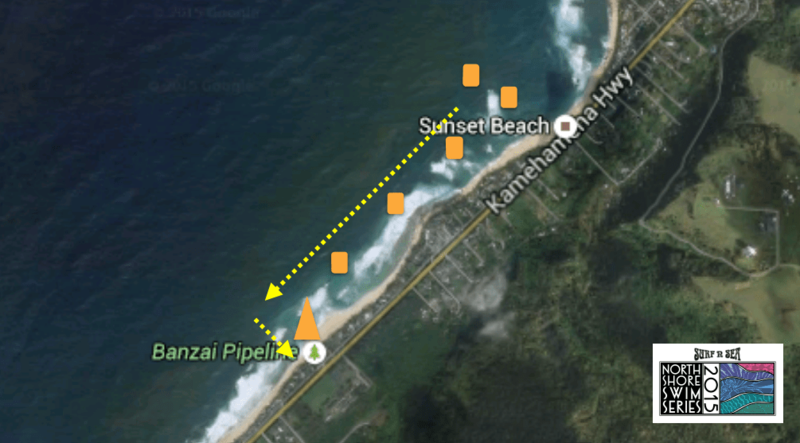 Stay outside of buoys if you are not familiar with local surf spots & reef outcroppings. If surf permits, participants will be allowed to swim on inside of these buoys. NOTE: There is sharp reef near Rocky Point and Gas Chambers surf spots. Please use caution in these areas. An 8’’ orange triangle buoy marks finish. Keep finish buoy on left shoulder. START Wave Start. Men start first, Women leave five minutes after. NOTE: Starting in the wrong wave will result in a DQ!